On December 28, 1941, British Prime Minister Winston Chur­chill left Wash­ing­ton’s Union Sta­tion for Canada. Six days ear­lier Chur­chill and his mili­tary and civil­ian advisers had arrived in the nation’s capi­tal to meet with their Amer­i­can and Cana­dian counter­parts. The visit by the two heads of state between Christ­mas and mid‑Janu­ary 1942 was the first stra­te­gic con­fer­ence Chur­chill and Pre­si­dent Franklin D. Roose­velt had had since the Japa­nese sur­prise attack on U.S. mili­tary instal­la­tions at Pearl Harbor, Hawaii, a little more than three weeks earlier, and it came at Churchill’s urgent request. In the Cana­dian capital of Ot­tawa, Chur­chill addressed Par­lia­ment on this date in 1941 in a master­ful per­for­mance simi­lar to the one he gave before a joint ses­sion of the U.S. Con­gress seve­ral days ear­lier, except this time he spoke in Eng­lish and French. Between passing from the Cana­dian House of Com­mons cham­ber to an ante­room, Chur­chill paused two min­utes before the cam­era of an Arme­nian-born Cana­dian. Yousuf Karsh’s iconic “bull­dog” photo of a scowling, bel­lig­erent, head-thrust-for­ward Chur­chill become one of the most memorable portrait images in history. Above: Yousuf Karsh’s iconic portrait of Churchill appeared on the cover of Life Magazine on May 21, 1945. 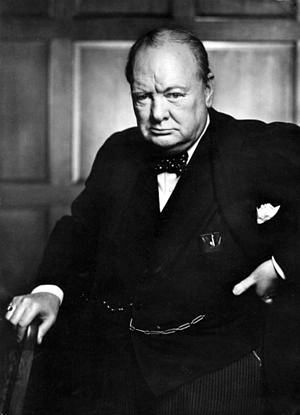 The image of Churchill brought Karsh inter­national promi­nence and is reputed to be the most repro­duced photo­graphic por­trait in history. Nice work for a man who claimed he was filled with dread meeting Chur­chill, whose scowl deepened when the photo­grapher dared to remove Churchill’s trademark cigar out of the great man’s mouth.